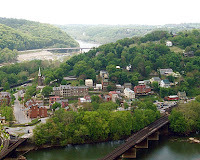 The dramatic history of this town in West Virginia’s north east Blue Ridge Mountains has left it with ghosts that appear to have unfinished business. View of junction of two rivers from Maryland Heights. 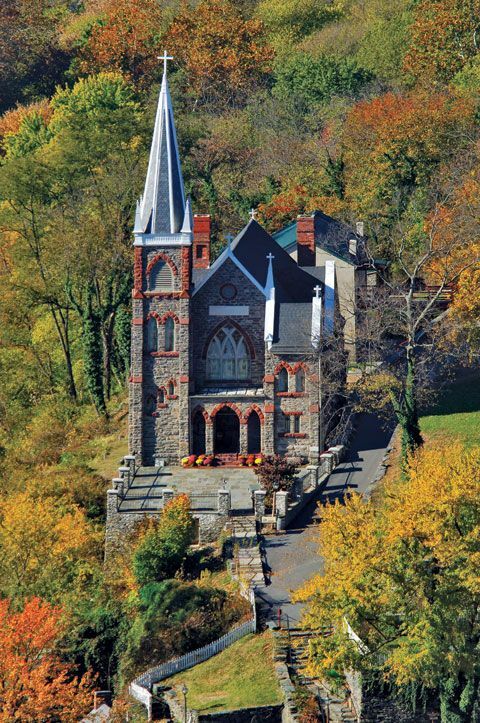 St. Peter’s Catholic Church sits high above Harper’s Ferry and is by far its finest structure. Designed in the Neo-Gothic style it is accessed via stone steps. It was built with native stone and has beautiful tiffany windows. Inside it has an impressive marble alter. It was built in the 1830s and restored in 1889. It is the only church that survived the Civil War in Harper’s Ferry and it is still an active church today. St. Peters was used as a hospital during the war and Father Costello who was the priest at the time tended the wounded. The ghost of one young Catholic soldier is still heard. This soldier was brought to the church wounded but was placed outside for his wounds were not as severe as others. It is said he was relieved to find himself at a Catholic church. Others state as they passed Jefferson Rock, late in the evening, they have seen an odd-looking priest walk right through a wall at the church. People have tried to talk to him but he never responds to their greetings. A witness who spotted the priest walk down the hill and then turn left toward the church and walk into the wall stated the temperature dropped. Then as he and a friend walked down the stone steps they felt as if they were being pushed down the steps. It was forceful enough that they had to lean back and brace themselves so they would not fall. Both said their legs shook. 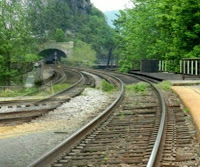 Another haunting in Harper’s Ferry takes place at a section of the railroad tracks that go through the Armory Yard. The first rail line came to the town in 1833. Part of this track passed a group of shacks near the river. When they were abandoned poor folks moved in. One family that lived in one of these shacks had an 11-year old daughter named Jenny. One evening as she stood near the fire her dress was engulfed in flames. In a panic she ran out of the shack and down the tracks. She then was struck and killed by an oncoming train. Today, engineers from nearby towns do not like the run through Harper’s Ferry especially on misty nights. Several have reported seeing “ a ball of fire careening wildly down the tracks.” They have heard unearthly screams at the same time. Some have even stopped their diesels, but never in time. They have felt a bump and when their trains have come to a complete stop they have gotten out to investigate. But they have not found anything. Because of this engineers traditionally slow down on this section of the tracks. The locals state if a series of frantic train whistles are heard at night it means Jenny has returned again. In Part l of Harper’s FerryNational Park the story of a Phantom Army is shared.